Is the SW Florida Real Estate Market Changing? Listing inventory rose slightly in Fort Myers and Cape Coral real estate markets in February from 6,192 single family homes on the market in January to 6,271 last month. Listing inventory typically peaks in January and declines slightly in February before Declining rapidly in March due to so many seasonal sales occurring. This year inventory actually rose in February and internal numbers we’re tracking in March show they’ve risen slightly again. This may be a sign that sellers have been a little too ambitious pricing their home and buyers have backed off bidding up prices. Prices typically peak in season then level off or decline a little bit the rest of the year. This is because most of the higher priced sales occur when we have the most visitors, but if that trend is peaking it will be interesting to see where the market heads from here. 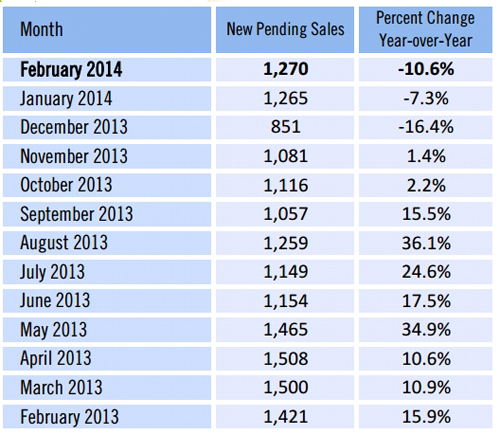 New pending sales in February are down 10.6% from last year. New listings are up 5.4% over last year. So we have increasing inventory and declining pending sales in the height of season. We’ll be tracking March numbers very carefully. It’s still possible March and April could be great as Easter is late this year but the pending numbers we’re looking at don’t bear that out plus we see rising inventory. Prices did rise in February up to a median price of $185,000 from $180,000 in January. Average prices rose from $301,035 in January to $311,536 Has the market peaked? Markets rarely stay constant. It’s possible the market is taking a break until it figures out where it wants to go. Properties in the $250,000 or less range are still flying off the market. Homes priced higher than $400,000 really need to make sure they’re priced competitively in the market as inventory begins to build the higher the price. Interest rates are rising again and it has put pressure on buyers. We just received some good news on flood insurance which will help the SW Florida real estate market compared to what we could have seen had the President not signed HR 3370 into law this week. New buyers will receive the same flood rates as existing homeowners do. Rates may still climb, but there are caps to how much and how fast, and before the new law was signed, there was no grandfather clause when a purchaser bought a property. This should provide some stability to costs for buyers which does affect their purchasing power. We’ve had some excellent weather down here and the weather up North has been dreadful. 2014 might be the year many will vacation down here and put plans into place to move here in the coming months. A few companies are also bringing jobs to SW Florida in the next few years. If the economy improves, our real estate market has more room to grow. If it doesn’t, our market may stagnate and remain at these levels. Like I said, the market rarely stands still. Forces affect the real estate market. Rising interest rates affect it negatively. Jobs and the economy do affect the market as well. We’re not sounding the alarm that we’re at risk of a downturn. We are saying we’re watching the numbers and we have a few things to keep our eye on going forward. The continued trend of rising prices may still occur, or it may subside and take a breather. If your plans depend on one outcome or the other this is information that may be useful to you. Nobody knows where the market is going exactly, or exactly when it will get there. If you’ve got a property to sell, give us a call and we’ll guide you through the market. If you’re a buyer, it pays to know what areas are hot and where inventory is building. We have the information. Let it work for you. 239-489-4042 or search the MLS at www.swfloridamls.Topagent.com Good luck and Happy Selling/Buying! If you’re considering buying or selling in Fort Myers, Cape Coral, Estero, Ft Myers Beach or anywhere in Lee County Florida, give us a call. 239-489-4042 or visit our website www.Topagent.com Search the MLS View Larger Map Feel free to view our Virtual Tours . Posted in Cape Coral, Cape Coral Real Estate, Fort Myers, Fort Myers Real Estate, Lehigh Acres, Southwest Florida Real Estate.Tagged Cape Coral real estate market, Fort Myers real estate market, Ft Myers Beach, Lee County Florida, listing inventory in Fort Myers Cape Coral MLS, rising interest rates affect, search MLS, SW Florida real estate market.